QuickLets, Malta’s largest letting agency, will be honoured at the European Property Awards at the Royal Lancaster, London on 25 the October 2018 for their achievements in delivering outstanding property rental services in Malta. QuickLets will compete against the best property professionals across the European region to be recognised in the Letting Agency category. The European Property Awards are judged by an independent panel of 80 industry experts. Judging focuses on design, quality, service, innovation, originality, and commitment to sustainability. The judging panel is chaired by Lord Caithness, Lord Best, The Earl of Liverpool, and Lord Thurso, all members of the House of Lords in the UK Parliament. “This comes as great and exciting news for our company. Since the day we started building QuickLets, we committed ourselves to create a specialised letting agency that puts our clients at the heart of everything we do. We built QuickLets on innovation, future-focused technology, an engaging culture and philanthropy”, says Steve Mercieca, Co-Founder and CEO of QuickLets, which forms part of the QLZH Group. “Seeing that the hard work of our team is being recognised fills our hearts with joy and satisfaction”, he continues. This is the second international awards participation for the QLZH Group this year. 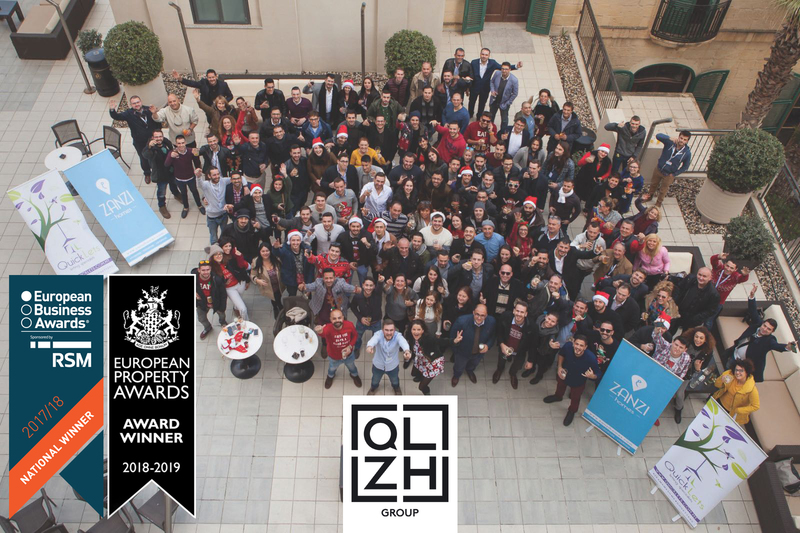 Last May, the QLZH Group was honoured in Warsaw by the European Business Awards in the Entrepreneur of the Year for Malta. Today QuickLets has a team of over 240 letting specialists and operates from 19 branches across Malta and Gozo. In the coming months, another 5 branches will soon be sprouting around the island. The company started in 2013 and has grown exponentially ever since. QuickLets is behind the introduction of the market disruptive Virtual Agent Concept, which has contributed to the group’s ownership of the largest and most up to date database on the island. The letting agency has always promoted sustainability of care for the environment. New foreign tenants who use QuickLets’ services are given a welcome pack that apart from traditional Maltese products, includes a voucher that enables them to collect free recycling bags from their Local Council. QuickLets is also one of the founding members of the QLZH Foundation which is under the patronage of Her Excellency Marie-Louise Coleiro Preca, President of Malta. The Environment, Adequate Housing and Education are the three main causes the Foundation works towards. “We strongly believe that the growth QuickLets enjoyed gave us an opportunity to be something more than just a letting agency. We wanted to create a movement that attracts like-hearted people who are genuinely eager to give back to the planet”, says COO Fabio Zuccaro. The European Property Awards are the largest, most prestigious, and widely recognised programme throughout the region. The top winners in each region will automatically be entered into the overall international awards, culminating in a glittering awards ceremony, held at the Savoy Hotel, London, on 3rd December 2018.